The explosion of activism since the Parkland shooting on February 14 led by young people in America has been heartbreaking, heartwarming and seemingly the most sustained attempt at changing the law to save lives. 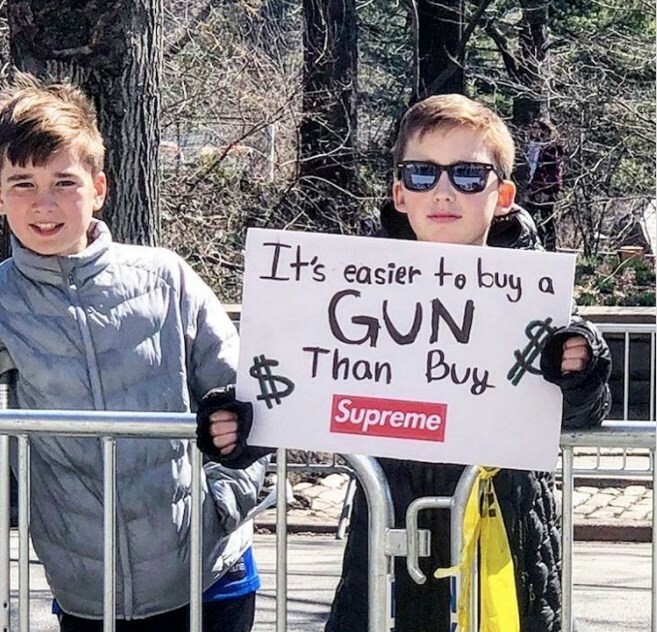 At the March For Our Lives protest, which took place all over the US and beyond but centred around the American capital, Washington D.C, the demands of young people were laid out clearly: a ban on assault weapons used in school shootings, restrictions on the amount of ammunition that magazines can hold and the implementation of laws requiring stricter background checks on every gun purchase. While the US President Donald Trump has stayed conspicuously silent on the march (he tweeted five times yesterday without mentioning it), all over the world people have been showing their support; including the UK Dunblane school massacre survivors. When Emma Gonzalez speaks you can hear the rawness of her pain. The 18-year-old survivor of the Parkland shooting who has been battling with legislators (including a Republican candidate who thought it was appropriate to call her a “skinhead lesbian” and “bald-faced liar”) since the massacre, made sure to mention the names of the students who were not lucky enough to survive the incident. She then held strong through a moment of silence, with the length of her time on stage recognising how long it took for the shooter to kill 17 students. “Six minutes and about 20 seconds,” she said. “In a little over 6 minutes, 17 of our friends were taken from us, 15 were injured and everyone in the Douglas community was forever altered,” she said. “I learned to duck bullets before I learned to run,” South LA native and youth leader Edna Chavez announced on stage. It was a heartbreaking reminder of just how young some of those affected by gun violence in the US can be. Chavez went on to explain that her brother had passed away due to gun violence. “My brother. He was in high school when he passed away," Edna said. "It was a day like any other day. The sunset was going down on south central. You hear pops thinking they were fire works. They weren't pops. You see the melanin on your brother's skin turn grey.” The crowd went on to chant his name: Ricardo. Kim tweeted that she was glad to be able to share such a special day with both Kanye and their daughter North West. “I hope North remembers this forever.” The couple attended the march in Washington D.C.